This tripod light has been inspired by old film lights. The natural coloured bamboo legs are offset perfectly with the dark grey matt metal work and the copper inner on the shade. The angle of the lamp shade is adjustable but the spread of the legs are fixed. The manufacturer recommends a max 40W bulb. An industrial style globe bulb would look fab in this lamp. 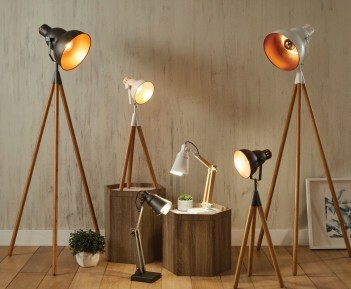 This floor lamp now comes in a new colour way, with the white metal on the external surface of the lamp head. This perhaps gives it a more nordic style feel. We now can't decide which one we like the best! Both are currently out of stock but we will be ordering more shortly.